On one side,they come out straight out of Mosques on Fridays and go immediatley on a murderous rampage and burn down churchs right and left and on the other side, there is a representative of the Lord Christ on earth who admonishes us to put on compassion, kindness and patience, forgiving one another, just as the Lord has forgiven us. The contrast can not be clearer. 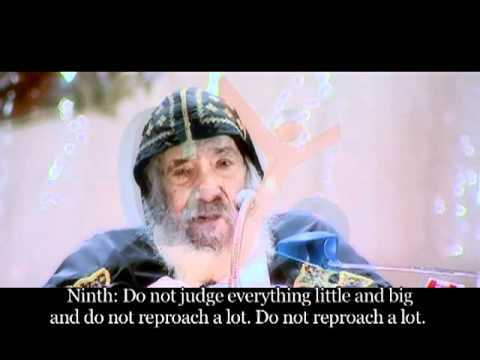 Baba Shenouda's call to forgiveness is not an optional request,but he stresses as "as the Lord has forgiven you, so must you also forgive one another". If we refuse to forgive others we will not be forgiven by God. As far as I am concerened,true forgivess is not easy. It takes a miracle to forgive someone who wants to destroy or eradicate you. But with God's help all things are possible, says HH Pope Shenouda. I do not know about you, but in this sermon HH was talking directly to my own character and as such it is having a huge impact on me. PS: Subscribe to the youtube channel of CYC and you will get update on new posted videos. is that the version with subtitles? (i can't get youtube from this computer) if not please let me know and i can link you to it. 1. Train yourself to endure. 2. Don’t let anger grow inside you. 3. Don’t let the sun go down on your anger. 4. When someone wrongs you tell yourself, the problem is not with the one who wronged you but with yourself for not enduring. 5. Try to forget the wrongdoing against you; forgive and forget. 6. Keep away from people who tell you of the wrong others say about you. 7. Train yourself to have a big heart and an easy-going temperment. 8. Don’t develop the habit of being the judge of every small or big thing. 9. Don’t keep reproaching people. 10. Don’t be swift to anger; don’t let it reach your tongue. 11. Remember the Bible verses against anger. James 1:20, Ecclesiastes 7:9. 12. If you can’t forgive the one who wronged you, at least don’t curse him or pray against him. 13. If someone sinned against you and asked forgiveness, don’t make him grovel. 14. Every time you ask the Lord to forgive you (in your prayers), remember the verse; ‘forgive and you will be forgiven’. 15. Try to win the sinner, saying to yourself; ‘poor thing, he sins out of weakness’. Amen!! the same blessing to you too. Mabsoosta thanks for the list.You spared me from the job. I will print some out and will hang at some places where its prescription is mostly needed.